I am deeply pleased and honored to be in this prestigious institution of diplomacy in this wonderful historical mansion, which serves the great tradition of Russian nation and Foreign Office; and I am honored by the presence of many distinguished diplomats, ambassadors, academicians and public figures. At the outset, I need to say a few remarks about the developing relationship between the Russian Federation and the OIC, being the Secretary General who has the honor of working for development of official relationship between the Russian Federation and the OIC since 2005. We have reached to a very important point where Russia has become very active within the framework of its status as the observer state. We have frequent political consultations; we have developed institutional cooperation regarding political issues. Meanwhile, in economic matters, in financial matters, in cultural matters and in other areas, we have improved relations. Yesterday, there was an agreement between some OIC institutions and economic institutions of this country for expanding the cooperation between the OIC and Russian Federation. Also the relationships of Tatarstan and Bashkortostan with the OIC institutions, like Islamic Development Bank (IDB), Standards and Metrology Institute for Islamic Countries (SMIIC), Islamic Chamber of Commerce and Industry (ICCI), are increasing in such fields as halal food, Islamic banking and the like; and I am really happy with this. The topic of my speech today is mainly the future of OIC, its role and the challenges in the Muslim World. Before discussing these issues, I think, we need to refresh our minds about the OIC. OIC has 57 member states and five observer states, including the Russian Federation. It is the second largest intergovernmental organization after the United Nations, with increasing number of countries in developing formal, institutional relations with the OIC through appointing special envoys, the first of which was the US followed by the United Kingdom, Australia, France, Canada and Italy. The current OIC activities are guided by two principal documents: the OIC Ten Year Program of Action, agreed upon in the historical summit convened in Makkah, Saudi Arabia in 2005, and the new OIC Charter, adopted in 2008 Dakar Summit. These two documents speak about the OIC as a vehicle of moderation and modernization in the Muslim world. Since 2005, the OIC has developed itself as a forum of cooperation and a promoter of moderation and modernization; and become a reliable counterpart and player in the global scene; and this relationship with the UN and other international, regional and cross regional institutions, is growing. Of course, these basic documents give prominence to and accept the universal values of freedom of speech, human rights, democracy, good governance, accountability, transparency; and also address the issues of women in society, and their empowerment and rights, not only by acknowledging them or accepting them, but also clearly advocating that these universal values are compatible with the Islamic values. Of course, accepting these values as norms was a challenge, because it was not easy to reach this point. Now, having succeeded in doing that, the second challenge is how to implement them in our countries. One of the major achievements of the OIC in recent years is the establishment of the OIC Independent Permanent Human Rights Commission (IPHRC). The IPHRC comprises 18 personalities, who are chosen for their credentials on human rights from 18 countries; and four of them are ladies and the chair person of this commission is a lady from Indonesia. The second feature of this change, of changing OIC landscape, is the focus on socio-economic development. Socio-economic development is the major target of OIC; and various OIC projects and programs, particularly in the field of poverty alleviation, are created for securing a rapid socio-economic development. Among them, the Islamic Solidarity Fund for Development (ISFD), which aims to raise a target capital of 10 billion US dollars, has so far extended financing of US$1.64 billion for poverty projects in various OIC countries. Another program, the Special Fund for the Development of Africa, aims to support socio-economic development projects relating to infrastructure, agriculture, industry, education, health and financial sectors in African members of the OIC. Under this program, the Islamic Development Bank (IDB) Group has already committed 5 billion US dollars for the benefit of 480 projects in 22 African members of the OIC. Now I would like to go back to emphasize the international role of the OIC on the international stage, which became visible in the last eight years, and developing its relations with major international and regional organizations. This has been stronger and more successful, and through effectively-dealing with different issues, like Niger, now in Mali, or as in the crisis years back in Mauritania, and with ongoing problems in Somalia and Afghanistan, and of course in Syria, the OIC has become a trust worthy international actor. I would like also to speak about other issues related to Islamophobia and better understanding between cultures and religions; and I have to express here very clearly that we appreciate Russia’s position on this issue. We have almost developed parallel situation in the UN, in the Human Rights Council (HRC), in other international organizational organizations, where there is a full cooperation between the representatives of Russia and the OIC countries. One good example in this context is the case of Resolution 16/18, adopted unanimously by the UN Human Rights Council in Geneva, which was built on the eight points proposed by me in 2010. It was an attempt from the OIC side to overcome the confrontation we had with the Western countries. The crisis had been started by the publishing of Danish cartoons – uncivilized ugly cartons – which, for no reason, attacked the revered and the sacred personality of our Prophet (PBUH). It is not whether you believe in him or not. You might believe in other religion; or you might be a non-believer. However, who are you to disrespect others? Why do you insult others? Why do you think that by insulting others you are expressing your freedom? In addition, when somebody comes and say: “please, don’t insult my sacred values”, you tell them: “This is my freedom; I have freedom of expression; I have freedom of depicting and doing whatever I like; and you cannot stop me. This is against human rights, against freedom principals”. This is really a twisted negative logic that is incomprehensible; that one exercises his freedom by insulting others, and not insulting just a few people, but insulting 1.6 billion people all over the world for no reason. Therefore, the OIC was very active in that field and we have managed with the support of our friends and also the Russian Federation to pass many resolutions against defamation of religions, not only Islam but all the religions. However, unfortunately the European countries and the US were against this at the beginning, saying that they do not agree with the notion of defamation of religions. It is not an unacceptable principle, we understand your worries on conscience but this is, legally speaking, not the proper way of doing things. Some of them and particularly the US were open and clear that they sympathized with us, but they had a problem because of the first amendment of their constitution on the notion of defamation. Without going into the details of that, we tried to find some new ways; and came with a proposal, consisting of eight points, which I presented to the UN Human Rights Council in Geneva in 2010; and the draft resolution was accepted by everybody. A similar resolution was also submitted to the UN General Assembly, and adopted subsequently in the past three years, and now we have five resolutions already. When we speak about the future of OIC, I think, it would lie in three domains. The first domain is to ensure peace and security by contributing to solutions of problems in our part of the world, where there are many diverse problems, which we are not, of course, at all proud of having them. However, this is an unpleasant fact that these many problems are in the Muslim world. Therefore, here, the OIC’s role on peace and security is very important; and it has the potential and has shown its capability in solving certain problems. It has a potential to act as an honest broker in times of crisis, as a mediator; and have a principle position in preventive, silent or quite diplomacy. This is mainly due to its comparative advantage in the region, where these problems or crises would occur in Somalia, or elsewhere. 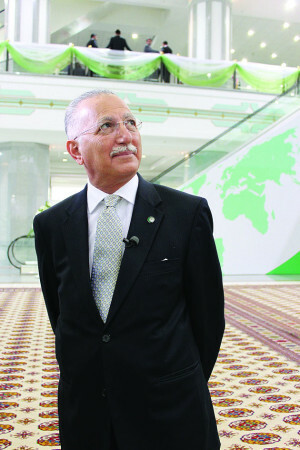 The comparative edge or comparative element of the OIC really helps activate its potential to act as an honest broker. The second domain is the human rights and socio-cultural domain. I think in the near future, the OIC should continue to strive for bringing a qualitative change to the human rights situation in all its member states, incorporating the contemporary universal values of democracy, rule of law, good governance, liberalization of political system and otherwise. When we look to the third domain, which is the economic one, I would like to say that the OIC presents a very promising future, despite all the problems that we are going through now in many of our countries. And this future also is shared with the Russian Federation. The emerging and developing countries, where many of the OIC countries are among them, are contributing increasingly more to the global production and trade of goods and services. When we put this phenomenon within the framework of the changing global economic context, where the center of gravity is moving from Atlantic to Asia, where the OIC countries are mainly located, we can understand better the strategic importance of this. Moreover, all the OIC countries have obtained promising results in recent years. They have doubled their production and increase considerably their share in the world production. In addition, they have more almost tripled their exports (2.9 times) and imports (2.84 times) since 2004. They have more than tripled (3.6 times) trade among themselves in the same period. This was one of the major points in the Ten Year Program of Action of 2005, when I started my office as the Secretary General. The total overall trade of OIC countries among themselves was around 205 billion US dollars in 2004. According to the 2012 figures, this total trade among OIC countries has reached to more than 742 billion dollars, an increase by 3.6 times. Moreover, this all happened before the implementation of the preferential trade system, which OIC has developed. Now there are more than 10 countries that acceded and took part fully in the preferential trade system of OIC, which is expected to increase significantly the intra-OIC trade. When you look to the World Bank report “Global Development Horizons 2011 – Multipolarity: The New Global Economy”, you find that developing countries (because there is no category of OIC and that is why I am referring to the developing countries) the developing countries’ share of international trade has increased from 30% in 1995 to an estimated 45% in 2010, in 15 years from 30% to 45%. Again according to the same report, the advanced countries’ economies are forecast to grow by 2.3% a year between 2011 and 2025. While the emerging economies. Including the OIC, are forecast to grow 4.7 percent a year. So you can see there that we can be clear that emerging economies will become increasingly important engines of global growth between 2011 and 2025. So, in 2025 the global economy will look quite different from what it was in 2011. Today’s emerging economies will, in real terms, account from 45% of global outlook, compared to 37% in 2011 and 30% in 2004. Additionally, the World Bank’s report introduces the multipolarity concept, meaning more than two growth poles will become dominant. In addition to current growth poles, like the US, European Union and China. It predicts that the formation of other potential growth poles at the international level, which include some OIC countries, like Malaysia, Saudi Arabia and Turkey. When the study is detailed at the regional level, among the top 3 countries, it lists Turkey at the second position after the Russian Federation in Eastern Europe and Central Asia region; Saudi Arabia, Iran and Egypt in the Middle East and North Africa Region; and Bangladesh and Pakistan in the second and third positions after India in South Asia. Indonesia is in the third position after China and South Korea in East Asia and Pacific region; and Nigeria in the second position after South Africa in Sub-Sahran Africa. These all are OIC countries. When we just remember that in the summit of BRICS where Brazil, India, Russia, China and South Africa met in Durban in South Africa in March 2013, took a decision on establishing a new development bank. They stated that the initial capital contribution to the bank should be substantial as sufficient for the bank to be effective in financing infrastructure. They also decided to create a contingent reserve arrangement (CRA) with an initial size of US$ 100 billion among BRICS countries to strengthen their financial stability and to prior shorten liquidity pressures, capital of the new development bank was not announced yet but the CRA fund of 100 billion is really an enormous figure. So, now if we examine other economic groupings of countries we find that Goldman Sax has introduced a new concept or new category of countries after BRICS: The category of “Next 11”. “Next 11” refers to those countries that have high potential of becoming, along with the BRICS, the world’s largest economic in the 21’st century and have a big impact on the global economy. This group includes 11 countries. Among them, in alphabetical order, Bangladesh, Egypt, Indonesia, Iran, Nigeria, Pakistan, and Turkey are OIC countries. The other ones from non-OIC are South Korea, Mexico, Philippines and Vietnam, so, out of the “Next 11”, 7 are the OIC Member States. Of course, if you look into the demographic aspects in 2030, according to a report by the Pew Forum, “The Future of the Global Muslim Population: projections for 2010 – 2030”, the global Muslim population is expected to reach to 2.2 billion while the total world population is estimated to increase from 6.9 in 2010 to 8.3 billion in 2030. The same research forecasts the growth of the global Muslim population (1.5 percent per annum) at about twice the rate of the non-Muslims (0.7 percent per annum) over the next two decades. So, this means that the share of Muslims in the world population, which was 23.4 percent in 2010 while reach up to 26.4 percent by 2030. Within the OIC group, the Asian group will continue to be the largest with 51% share in 2030 (but declining from 54% in 2010) in the total OIC population. So, you see that the OIC future in the world from political aspect, from economical aspect, from demographic aspect is promising. And I also think OIC in the UN should acquire a new position. Now the OIC group in the UN, and this is my last point, MR. chairman, the OIC now is the biggest voting bloc. And this has been experienced by everybody and I think, aids to the prominence of OIC. During the first reconsideration of the reform in the UN, I think there should be a seat for OIC in the Security Council. Because if you look to the structure of the Security Council of today, you have the P5 (Permanent Five) and there are representatives of different civilization, different cultures, political powers, of course, but you won’t find representative of more than 1.6 billion people of Muslim world. Meanwhile, when you look to the other 10 non-permanent members, you will find that 4 countries have always from the Asian and African groups and are always among the members of the Security Council. And I think the status acquired by the EU in 2011 in UN should also be acquired by the OIC. The EU has acquired a new status, where they can involve, propose items on agenda and speak in the General Assembly on behalf of the member countries. Well, some can argue that there is ad difference between the structure of the EU and that of the OIC, but I think that we should keep in mind that we have to develop our position there. With these remarks, Mr. Chairman, on the OIC’s future and role, I would end with thanking you for giving me the opportunity of speaking to such a distinguished audience in this beautiful place in this wonderful context.